There can only be drama if a top seed is actually threatened, say, by having at least to fend off break points. But that wasn’t the case today. 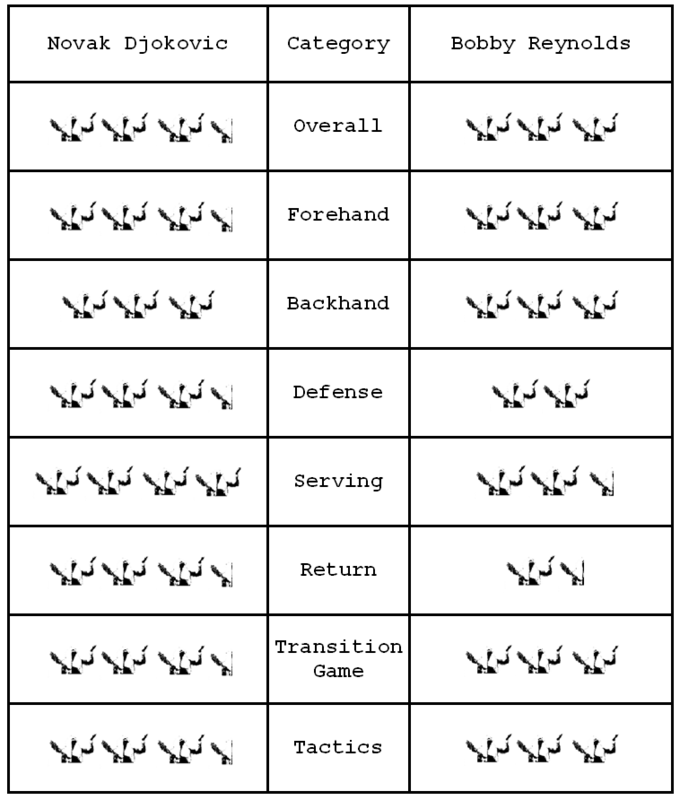 Bobby Reynolds couldn’t manufacture a single break point in 3 sets of tennis, and even when he pushed Djokovic to a tiebreaker (in which he fell behind 0-5 pretty quickly), it never seemed like the World No. 1 was in any sort of danger. Yes, we know that Federer and Nadal both bowed out to opponents ranked outside the top 100 (Reynolds is currently ranked at No. 156), but both Darcis and Stakhovsky have won ATP titles and been consistent pros for a while. That is just not the case for the 30 year-old American, who’s toiled most of his career in the Challenger circuit. Again, the only question about this match was what would happen when (not if) Djokovic would gain any sort of lead. Would Reynolds keep battling? Could he somehow pull level? The answer to the first question was yes, but the answer to the second was a resounding no. And when a match is so devoid of uncertainty, it’s really difficult for it to avoid becoming a rather dull affair. For 1.5 sets, the World No. 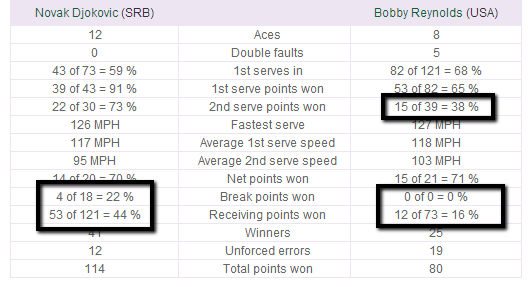 1 created endless chances to break Bobby Reynold’s serve, but just couldn’t find a way to capitalize on them (Reynolds saved some of the break points with good shots, but that wasn’t the case for a significant portion of them). It was crucial for Djokovic to start the tiebreaker in dominating fashion, to take any potential for drama out of the question, and he did. Then, when the Serb finally broke through in the second set, his efficiency thereafter improved dramatically. Djokovic did take a couple of tumbles, but seemed to be unharmed. He’s onto the next round without dropping a set (or getting hurt), which is a bonus in this very bizarre edition of Wimbledon we’re having. However, it must be said that Djokovic’s level did dip a bit from the excellent showing against Florian Mayer in the first round. And while Andy Murray’s draw is free of all the potential dangers in it, Djokovic’s two main threats (Haas and Berdych) are still in the tournament. Hence, the road isn’t getting any easier for the 2011 champ. Bobby Reynolds tried as hard as he could to stay with the World No. 1: he staved off endless break points, and he had the occasional flash of brilliance from the baseline. Still, Reynolds only managed to win 16% of all return points (12 of 73), and as I wrote above, didn’t have a single break chance in the whole match. That last statistical bit simply means that he never really threatened an upset of any kind today. The 30-year old veteran was making his first Wimbledon main draw appearance since 2009, which was a year removed from his best showing: a Round of 32 loss to Feliciano López. Overall, Reynolds is now 5 and 12 on grass in his career. Still, he got to play the World No. 1 on Centre Court at Wimbledon. That’s something very few people get to say about their career. More than that, Reynolds knows that he gave it his all. Which is the best possible feeling one can have. Amazing experience to play on the most holy of tennis grounds, center ct Wimbledon…appreciate all the support. Can't wait for next year! !